The origin of Kalimotxo(also known as Calimocho) comes from the Old Port of Algorta. Although the mix of red wine and Coca-Cola already existed in Spain from the 1920s, it was a minority drink as there were harldy any establishments that served the American refreshment. But it was on 12th August 1972, during the St. Nicholas festival at the Old Port of Algorta (Getxo), when "Kalimotxo" was truly born. The invention of the term is attributed to the “Antzarrak” group who that year were in charge of organising the celebrations. Therefore, they bought 2,000 litres of red wine that, maybe due to the heat or the guile of the sellers, had an unpleasant taste. They had to find a way to sell the bad wine. Given that they could not buy new wine various mixtures were made, and they eventually tried it with Coca Cola. They said to cover the flavour of the bad wine they decided it was necessary to have the ratio of 1:1 of wine and coke. They were struggling to find a name for this “potion”. At the beginning they could not agree on a name, until a friend of the group appeared with the nickname “Kalimero” but was better known with the abbreviation of “Kali” who had an unsightly appearance; someone commented that in ugly Basque his name is said as “motxo”, and so the name Kalimotxo was quickly and unanimously adopted by everybody. The success was incredible. 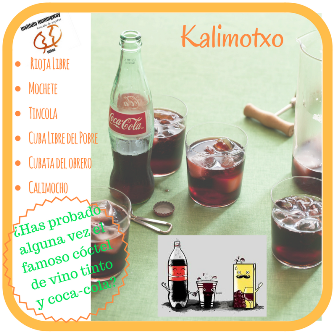 The term “kalimotxo” spread throughout the Basque and Navarra regions, and had become widely popular by the start of the 1980s and spread to the neighbouring regions and finally to the whole country and the rest of the world. Later, the world famous Coca Cola officially registered the name of the popular drink. Even the Royal Spanish Academy of Languages recognises the denomination Calimocho as the name of a mix of red wine and coke. Have you enjoyed this article? If so, visit Bilbao and submerge yourself in our popular culture. Instituto Hemingway greatly appreciates the areas of Getxo and Algorta , sharing their stories and allowing our Spanish students to enjoy all they have to offer.